Relient K has consistently released one limited-print EP alongside — usually a few months before or after — each album. But they’ve never done anything quite like The Bird and the Bee Sides, a 26-track double-EP that serves both as a 13-track set of new content and a collection of remastered rarities and B-sides. It’s really one of the great fan services I’ve ever witnessed from a band. The first thirteen tracks of the disc are all new songs and are subtitled the “The Nashville Tennis EP.” As the (quite clever) name suggests, it has a little bit of a southern, rootsy undercurrent to it. An acoustic and country instrumentation gets some rotation with the usual guitars, bass, and drums. But aside from this — and the resulting sonic texture that’s very amber and warm — the thirteen songs here have little in common. It’s clear that most of them are leftovers from the Five Score sessions: Most of the tracks are good ideas that didn’t quite develop or tracks that are novelty or somehow on the fringe. A few of the tracks were written by members of the band other than Thiessen (“No Reaction,” “The Last, The Lost, and the Least,” and “You’ll Always Be My Best Friend,” a cute ballad co-written by Thiessen and lead guitarist Matt Hoopes). A few are underdeveloped (“Beaming”) or ideas that have been tossed around for awhile (“There Was No Thief,” a reinvention of “The Thief” from “The Apathetic EP” that followed Mmhmm). And a few are just not as compelling as the songs on Five Score (“The Lining is Silver”). My favorite tracks from the “Tennis EP” are “At Least We Made it This Far” a melancholy love song that bemoans the difficulty of long-distance romance, and “Where Do I Go From Here,” which could easily pass as a solid Mmhmm track if not for the banjo intro. I also want to call out “Bee Your Man,” a novelty/comedy track that rounds out the first half of the disc. I love it not for jokes, but because of how good it actually sounds. It’s a bluegrass/country spoof that, for the twenty or so seconds it’s a straight-face performance, is really good. Relient K could really make a great country-pop album. Some of the best moments of recent albums (“Faking My Own Suicide,” “At Least We Made it This Far”) have been folk and country-tinged. 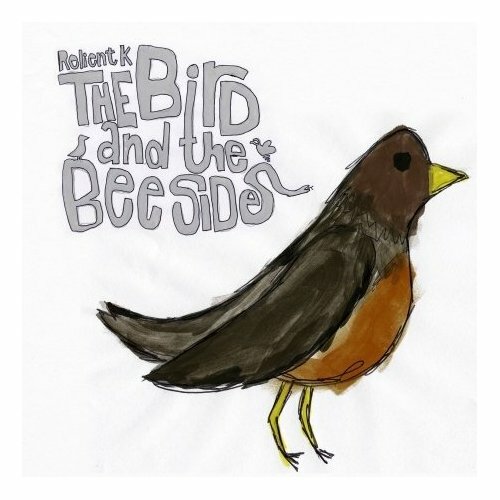 The second half of the disc is subtitled “The Bird and the Bee Sides” — yep, the same name as the full package — and it’s a bunch of demos, old EP tracks, and acoustic renditions of album songs. Every song, except for a couple of the acoustic cuts and maybe a demo or two, predates Mmhmm, so there’s lots of vintage RK silliness packed into these tracks. Most of them are not worth more than a single listen, but I appreciated having access to them nonetheless. Fans more obsessive or nostalgic than I, particularly those disappointed with the band’s recent releases, might find this set extremely valuable. But little here matches the band’s goodmoments, even if these throwaways are good slices of catchy fun. The one song here that I unconditionally recommend is the reinvented “Jefferson Aeroplane,” a track that was initially tucked away as the last track on Two Lefts. There, it was a solid but understated way to close a really strong album. Here, it’s fleshed out with acoustic guitar, a more interesting percussion part, a re-write of the meandering ending, and beautiful vocals. This alternate version of “Jefferson Aeroplane” ranks as one of the best tracks ever by the band. What I really love, though, is that Relient K would put in the effort to not only collect these dusty records — the type that fans unfairly obsess over simply because they’re hard to find — but that they’d put in the effort to get them remastered and sounding just right. Particularly welcome are the four songs on The Vinyl Countdown EP, an older disc (aptly) only available on vinyl. The Bird and the Bee Sides, while not as essential as the band’s real studio albums, is not an empty cash-in. Some of the remastering adds an excessive layer of texture to the really early, simplistic B-sides (“For the Band,” I’m looking at you). But it’s great to see a band putting forth a fan-first project like this. Matt Hoopes is not the bassist.